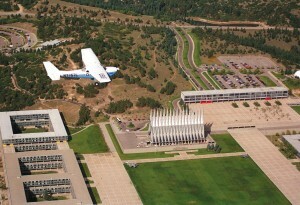 A T-41 flies over the Air Force chapel. Leading U.S. military aviators including Brig. Gen. William “Billy” Mitchell fostered the concept of a separate Air Force, with its own academy to prepare officers, for many years. Mitchell tried in vain to persuade first the government and then private interests to establish such a school. Finally, after WWII demonstrated the decisiveness of air power, in 1947, Congress granted authority to withdraw the Air Corps from the Army and establish an independent Air Force. This paved the way for eventual passage of the Air Force Academy Act. In 1949, a board of military and civilian educators concluded that a nucleus of regular officers for the armed services should be educated, trained and dedicated from youth onward for a lifetime of service to their country. The board pointed out that West Point and Annapolis had produced highly trained officers for years, but that the needs of the Air Force couldn’t be met by expansion of the older service academies, and recommended that an Air Force academy be established. Dr. John A. Hannah, president of Michigan State University, was Assistant Secretary of Defense for Manpower and Personnel during the hearings and legislation to establish the academy. On April 1, 1954, President Dwight D. Eisenhower signed a bill authorizing the establishment and construction of an Air Force academy. Selection of the permanent site became the responsibility of Harold E. Talbott, the Air Force secretary at the time. He chose as his committee Dr. Virgil Hancher, president of the University of Iowa; Merrill C. Meigs, vice president of the Hearst Corporation; Gen. Carl A. Spaatz (USAF, ret. ); Brig. Gen. Charles A. Lindbergh (USAF Reserve); and Lt. Gen. Hubert R. Harmon, USAF. After looking at over 500 proposed sites in various states, the committee reduced the number to three possibilities: Alton, Ill.; Lake Geneva, Wis.; and Colorado Springs, Colo. 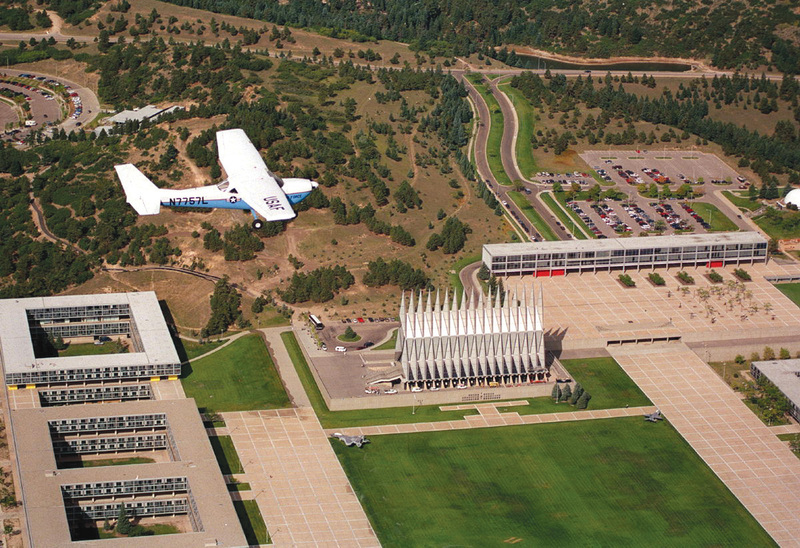 Following a personal inspection of the three locations, the secretary named Colorado Springs as the permanent home of the U.S. Air Force Academy on June 24, 1954. Governor Dan Thornton convinced the Colorado state legislature to allocate $1 million to help buy land, which would be donated to the cause. The first class of 306 men began training at temporary facilities at Denver’s Lowry Air Force Base, on July 11, 1955. The cadets moved to the permanent location three years later, where 207 second lieutenants graduated in 1959. In a debate whether to provide pilot training at the academy, some argued it was an intrinsic part of an Air Force officer’s career. Others said the academy should be an institution of higher learning like the other service academies. The initial plan called for pilot training for all cadets in their third and fourth years. Those unable to complete the training would receive additional training to prepare for non-rated careers. Eventually the sides compromised, with flight theory and training integrated into the academic program, with a minimum of actual flight instruction. A cadet makes a freefall-style parachute jump. 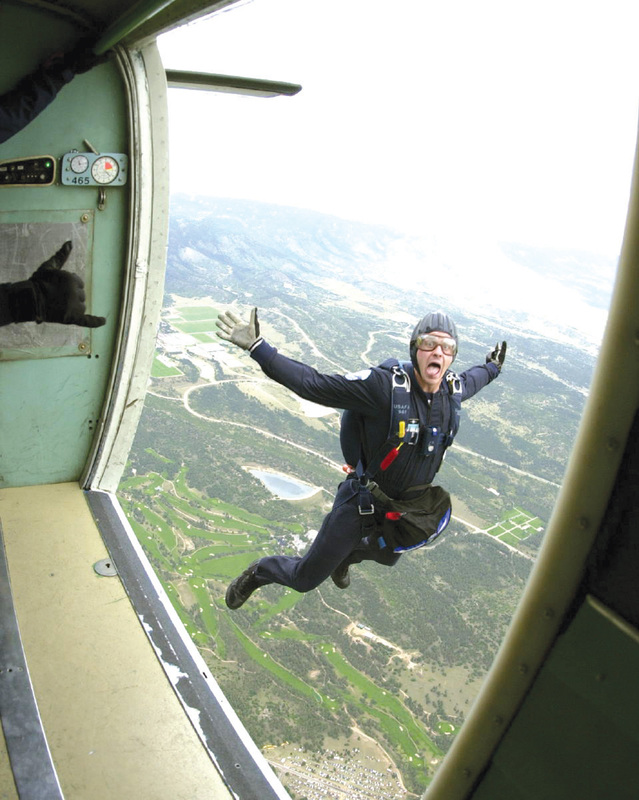 After completing five freefall jumps, and the basic parachuting course, cadets are eligible for advanced training, and a chance to join the Wings of Blue parachute team. Academics at the academy have evolved over the past 50 years; today the core curriculum includes courses in science, engineering, social sciences and humanities. Cadets take additional elective courses to complete requirements for one of 25 major areas of study. Athletic programs are designed to improve physical fitness, teach athletic skills and develop leadership qualities. Although more officers receive commissions through ROTC each year, the odds of becoming a pilot through the academy are better. The academy has graduated about 36,000 cadets; 24,500 were pilot-qualified at graduation, and 20,500 of those have gone on to pilot training. On average, at least half of academy graduates will qualify for pilot training. Being appointed and accepted to the Air Force Academy is the most challenging, competitive and rewarding route to becoming an Air Force officer, and pilot. About 13 percent of all academy applicants are accepted; academic and extracurricular activities make up 60 percent of an applicant’s score. Women first entered the academy on June 28, 1976, as members of the class of 1980. Since 1990, attrition has averaged about 20 percent for each graduating class. All cadets participate in some form of air activity in each of their four years; the airmanship programs are a vital part of a future pilot’s course of study. There are 21 courses, which offer basic to advanced instruction in gliders, parachuting and single-engine airplane experience. Over 25,000 sorties are flown in these programs annually, and nearly 1,000 solos are made each year, some conducted from an airstrip near the south entrance of the academy. It usually takes the average student 12 sorties to solo. There’s a soaring curriculum run by senior cadets, a flying club, and a flying team that competes against 144 colleges nationwide. Each cadet graduates with a bachelor of science degree, a commission as a second lieutenant in the United States Air Force, and a “secret” security clearance. The officer agrees to serve for at least eight years after graduation; five must be active duty. If the officer becomes a pilot, they serve 10 years. 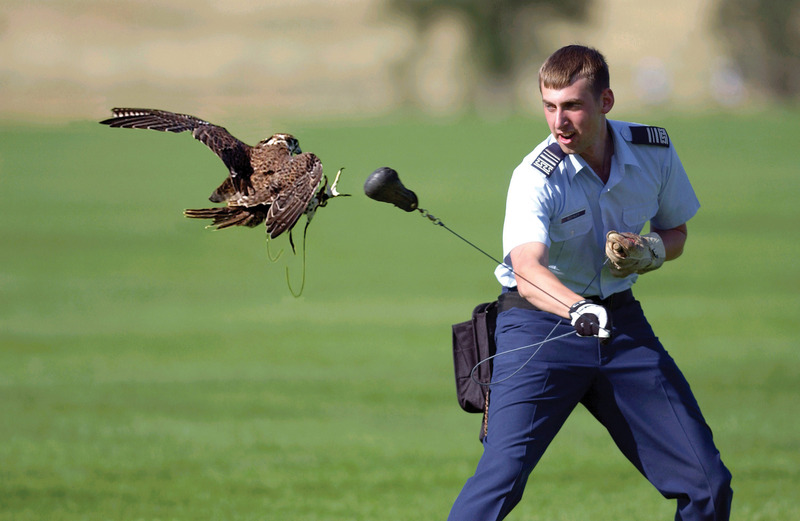 This first class cadet lets “Liberty,” an academy falcon, catch a food-laden lure during falcon training. 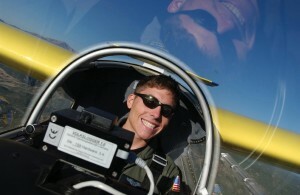 This cadet wears glider pilot wings. The big grin shows he’s enjoying himself high above the academy.